Presented here in Italian, "Santa Lucia" is one of the world's favorite traditional Neopolitan songs. Arranger Mary Ann Cooper’s setting introduces singers to just two verses of Italian. This allows the singer to experience the purity of Italian vowels which leads to artistic choral blend and harmonic solidarity. "Santa Lucia" has been embraced by audiences and singers from Enrico Caruso to Elvis Presley. 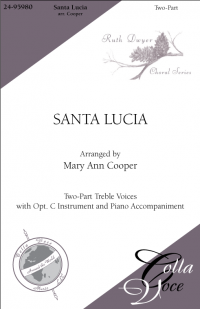 "Santa Lucia" will bring a bit of an old Naples waterfront to your audience and singers as they envision a boatman on gentle waves gleaming with silver light and the cool shore breezes in the Bay of Naples.